The poblano is a mild chile pepper originating in the State of Puebla, Mexico. Dried, it is called an Ancho. The ripened red poblano is significantly hotter and more flavorful than the less ripe, green poblano. While poblanos tend to have a mild flavor, occasionally and unpredictably, they can have significant heat. Different peppers from the same plant have been reported to vary substantially in heat intensity. I like to choose a mild flavor and add a touch of heat to the filling, usually satisfying everyone. Roast the chiles on your gas stovetop, hot grill, or in a broiler on high heat. Turn them occasionally until the skins are blackened and charred. When the skin of the chiles is sufficiently charred and blistered, remove from the heat and let them cool in a covered bowl to room temperature so you don’t burn yourself. Peel the skin from the cooled chile, rinsing your fingers if they become sticky. I find using a small knife and laying the chilis on paper bags helps. Be careful to not tear the chile while peeling it. *If fresh green chiles are unavailable, use canned whole green chiles Anaheim Chiles. For truer mexican, choose poblano chiles that are deep green and have no blemishes, soft spots or wrinkles. 2.Remove the seeds if the poblanos smell hot otherwise, enjoy the heat. Here is the tricky part. Roasted chiles are very soft, and tear easily. You are going to make a small slice into the side of the chile just big enough to get a spoon into, about 2-3 inches. (Or use an existing tear if there is one.) Insert the spoon into the chile and scrape the seeds and the white membrane out, try to not tear the chiles flesh any more than possible. Place a slice of cheese into the chile, or spoon the filling in, but don’t force it. If the cheese is too large, trim it down until it fits inside. Don’t over-stuff it. Make sure the open edges of the chile still come together. 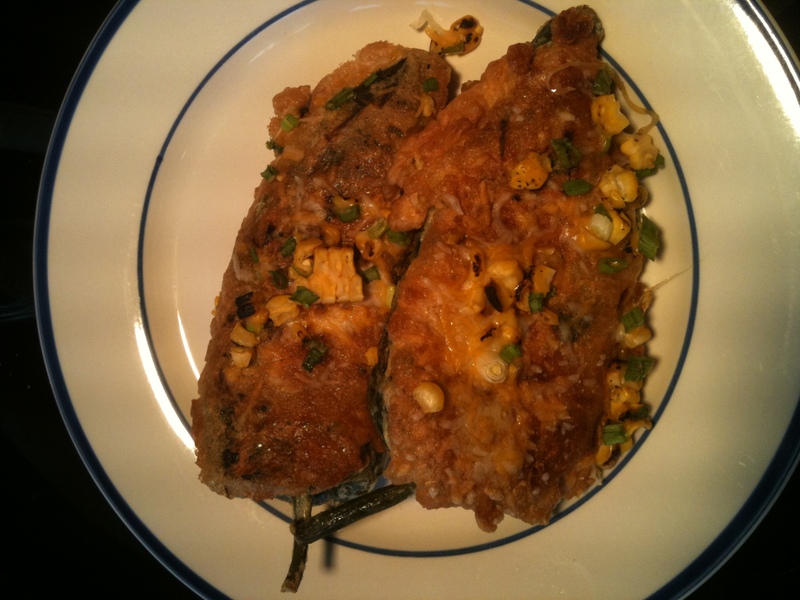 I like monterrey jack, and grated cheddar with chopped scallions and roasted corn. To add more heat, finely dice jalapeno chili and add to the filling. A little goes a long way. For smokey flavor add 1/2 teaspoon of chipolte in adobe sauce. Lightly flour the stuffed chili then dip into egg mixture of beaten egg whites until fluffy, then add the yolks. op. Use your finger to make sure the entire chile is coated. Dust off remaining flour and set chiles aside. For a simple batter, whip 3-6 cold egg whites in a chilled bowl until they are stiff. Stir up the remaining yolks and slowly fold them in with a pinch of salt. Use approximately 2 large eggs for each pound of chiles, or 1 egg per extra-large chile. Combine dry ingredients, then wet and then mix together. 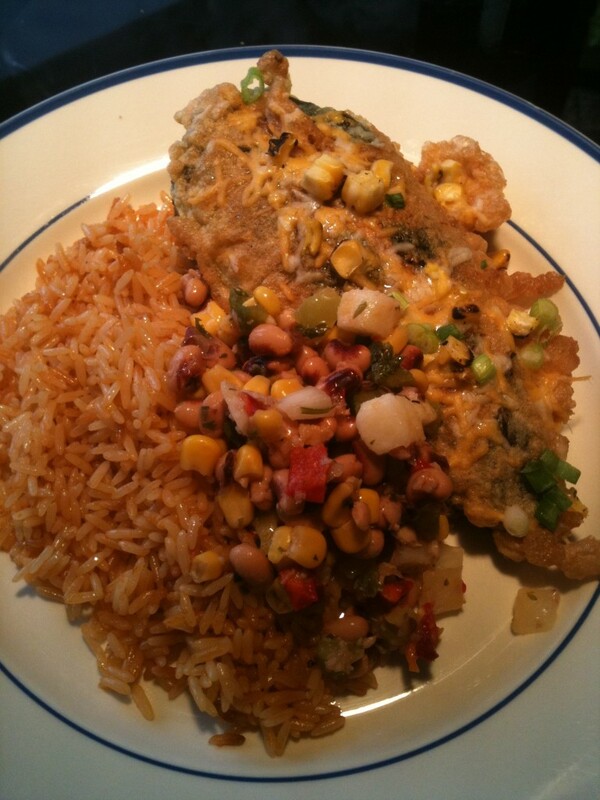 One at a time, hold the chiles by the stem and support the bottom with your fingers or a spoon, and dip the stuffed chiles into the batter. Carefully place them into a pan with 1 1/2 inches of hotu ar oil. Cook each side until batter is a crisp golden brown. Remove chiles from the oil and drain on paper towels. Serve immediately with your favorite salsa. Keep in a oven until ready to serve. Serve over rice with warm spicy mexican tomato sauce. 1.Use cold eggs for the batter. 2.Test the oil with a drop of batter before putting a whole chile in. If the drop of batter sizzles and floats to the top, it’s the right temp. If it sinks, the oil is not hot enough. 3.The flour should be a very light coat. It helps the batter stick to the chile. •Sliced cheese, shredded cheese, shredded seasoned chicken or other filling. 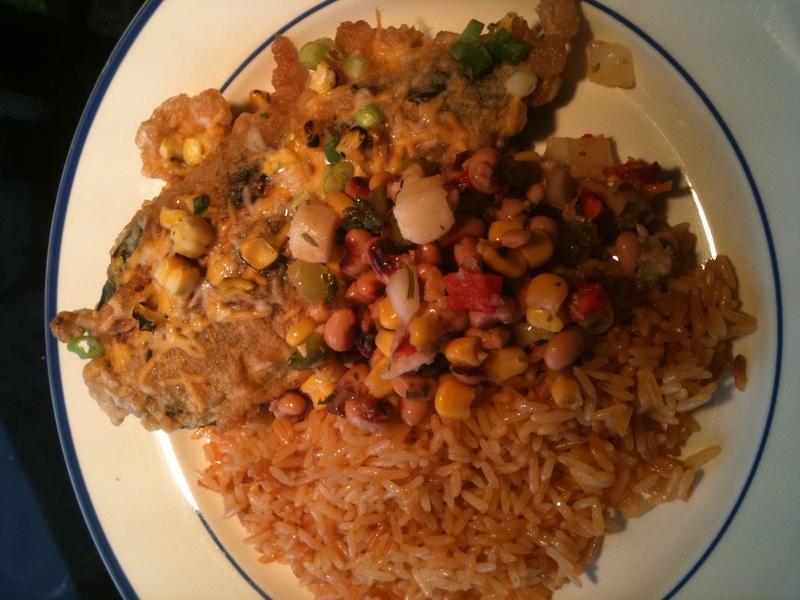 This entry was posted in Fan Favorites, Mexican Restaurant and tagged chili, Corn, monterrey jack, poblano, rellenos, Roasted. Bookmark the permalink.